In spite of austere finances, the government of the unrecognized Transnistrian republic in eastern Moldova throws millions of dollars from public coffers every year, providing this way relief or advantages to firms that are run or controlled by local elected representatives. During the past three years alone their benefits amounted to 200 million US dollars – this is more than half of Transnistria’s budget. The budgetary deficit of the secessionist enclave, which calls itself Moldovan Transnistrian Republic, is at least 20%: it amounted to around 66 million US dollars in 2013 and 80 million dollars in 2014. Last year the deficit stood at 69 million dollars, or twice as much as the republic’s pension fund. Nonetheless, Transnistrian authorities remain generous in granting financial support to a number of local enterprises, either in the form of relief for natural gas consumption or customs duty exemptions, or tax cuts. RISE Moldova has learned from official reports it obtained from the Transnistrian executive administration that a number of companies connected to high ranking officials received benefits worth more than 2.5 billion Transnistrian rubles (approximately 200 million dollars) between January 2013 and July 2016 alone. In theory, beneficiaries must comply with a range of severe conditions in order to qualify for aid, such as continued employment of productive personnel and same wage level, but in practice some companies breach the rules and get cover from authorities. One example that illustrates this complicity is Moldavizolit, a manufacturer of plastic items. The sole shareholder of this closed company is Universal-Trade, a firm owned by Yevgeny Gushan, a member of the local parliament and son of Transnistrian oligarch Viktor Gushan. 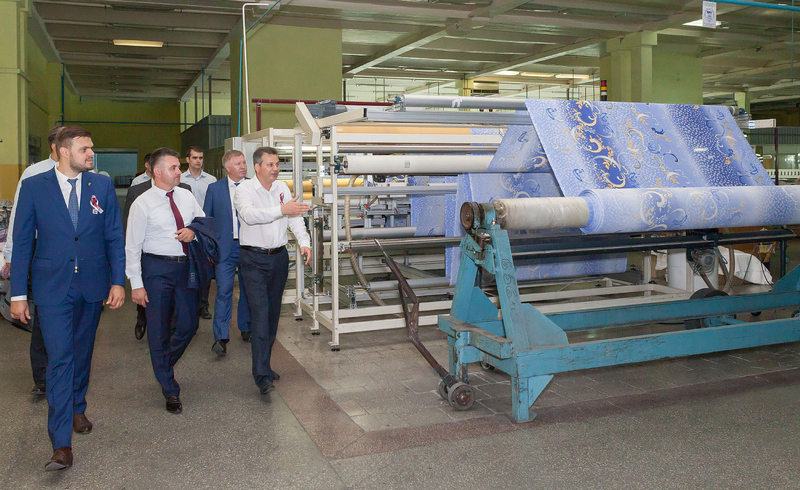 Moldavizolit’s CEO is Porfiryi Shkilnyuk, who is also a member of the Supreme Soviet in Tiraspol. Official papers show that in 2014 through the first half of 2016 Moldavizolit benefited from 50% tax cuts and cheap natural gases totaling 25.3 million rubles (2 million dollars). But public reports of Transnistrian authorities suggest that the company didn’t comply with the main conditions for aid. In 2015, for example, Moldavizolit laid off 150 workers, citing financial hardships in the republic. The remaining employees were told to take unpaid leaves. And yet, the Transnistrian government continues lending its support to Moldavizolit. Yevgeny Shevchuk, the president of Transnistria, admitted that Moldavizolit had received subsidies worth more than 6 million dollars from his administration, in the form of ten-fold lower price for natural gases – not to mention other forms of aid. He also acknowledged that none of the industries in the breakaway enclave ever paid the full, market price for energy resources. Some Transnistrian MPs too have objections over the policy of the Transnistrian executive administration. They complain that thanks to Mr. Shevchuk’s cabinet a company called Energokapital had underpaid for Russian natural gases from sold to Moldova, making huge money for mediation services – not making even a transportation-related effort. Another example how to make cash on the expense of public coffers in Transnistria is Tirotex-Energy, a power station run by MP Vadim Levitsky. The station produces electricity for the region’s largest textile factory, Tirotex, which is run by another MR, Andrei Mezhinsky. RISE Moldova has learned that Tirotex-Energo generates electricity from natural gases which it procures for just 15 US dollars per 1,000 cubic meters. The price difference is covered by the local government. The shipping price of Russian natural gases supplied to Transnistria was 220 dollars per 1,000 cubic meters in February 2016 and approximately 180 dollars in April through July same year. Official reports from Transnistria also demonstrate that aside from preferential gas price, Tirotex-Energo was exempted from 5.6 million dollars in ordinary – and mandatory – taxes during 2010-2015. The final beneficiaries of the Cypriot company are hiding behind a complicated scheme that is made of an offshore chain. There are clues however suggesting that these are influential, high ranking persons from same Transnistria. In one example, we learned that between 2007 and 2010 local oligarch Viktor Gushan and his business partner Ylya Kazmaly had acted as administrators of one piece of this puzzle – Fidanza, which was the founder of Liselini Holding, which in turn was the founder of Lenmana Limited. The history of Tirotex financing isn’t over yet. Official data released by the Transnistrian Ministry of Economy show that this company had benefited from direct government support amounting to 100.4 million Transnistrian rubles (almost 9 million dollars) during 2014 through the first half of 2016. During almost a decade, from 2006 till 2015, the executive administration of the unrecognized republic offered approximately 45 million dollars in financial assistance to Tirolex. Another example is the Bakery Plant in Tiraspol, which is part of the powerful Sheriff Holding, where another MP, Alexander Martynov, had served as chief of the Economic Department. Since 2008 until present day this bread producer saved 17.9 million Transnistrian rubles (around 1.5 million dollars) thanks to subsidies from the region’s government. In January 2012 – June 2014 alone it benefited from 5.1 million rubles in aid. Another firm of the Sheriff Holding, Aquatir, enjoyed plenty of generosity from the regional authorities too. From 2011 till 2015 this firm benefited from “state favors” worth 113,000 dollars. Aquatir is Transnistria’s largest caviar producer and operates the biggest fish farm there. In September 2016, Yevgeny Shevchuk tabled a legislative bill before the Supreme Soviet which provided for restitution of 25% of the aid Sheriff Holding received in 2006-2011 in the form of economic relief, direct subsidies, duty exemptions or tax cuts. He argued that the measure was designed to build a fair approach in the government-business relationships and that the overall assistance for Sheriff during that period valued one billion dollars. The MPs accepted this draft for review and passed it with a number of major changes. For example, instead of obliging Sheriff to pay back 250 million dollars to the public coffers, they provided for all businesses that had received tax facilities to transfer that money to the government. Those amendments made Mr. Shevchuk change his mind and his declined from signing under his own initiative. His aides defended their boss by claiming that the Supreme Soviet had breached several legal procedures including the adoption of this important document in two lectures within the same session.